PlateRite FX870II / FX870IIE | SCREEN Graphic Solutions Co., Ltd. 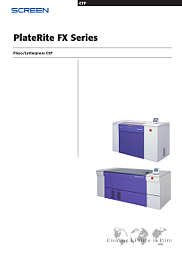 Consistent plate qualityThe PlateRite FX870II / FX870ⅡE eliminate many of the problems associated with platemaking using film, including image unevenness, problems caused by dust, and UV scattering. They also eliminate the many problems inherent in going from film to plate, such as misalignment of the film during platemaking and registration errors arising from stretching of the film. This helps ensure consistent plate quality and reduces the waste inherent in repeating plate output due to errors. 4,800 dpi resolution for high-quality outputThe PlateRite FX870II / FX870ⅡE offers a maximum output resolution of 4,800 dpi. This high resolution significantly reduces the incidence of problems common in low-resolution output, such as jaggies in diagonal lines and curves, and dramatically improves the repeatability of fine line reproduction. 4,800 dpi output also delivers smooth gradations, and almost completely eliminates unevenness, even in the highlight areas. Easy OperationLoading plates onto the drum is simple. The operator simply uses clamps to fix the leading edge of the resin plate in place and then attaches the trailing edge with tape. Leading edge clamps, paired with the design of the suction gutters on the face of the drum, make it possible for the PlateRite FX870II / FX870ⅡE to handle a variety of plates ranging from a minimum of 100 x 100 mm (4” x 4”) to a maximum of 870 × 762 mm (34.2” × 30.0”). This makes the PlateRite FX870II / FX870ⅡE perfect for producing the A3 and A4 size plates that are standard in the label industry, while also providing the flexibility to produce larger, A1 size plates. *1 Note that 4,800 dpi screening is not possible for thermal offset plates. *2 Productivity may vary depending on the media sensitivity. *3 Supported thermal offset plate sizes range from a maximum of 870 x 762 mm (34.2" x 30.0") to a minimum of 200 x 100 mm (7.9" x 4.0").